This has been a busy year for the Regional Connector project. All of the project’s progress —from relocating major utilities to mining twin tunnels — was helped considerably by community support. The Regional Connector will connect the Blue, Expo and Gold Lines via twin tunnels below downtown Los Angeles. The tunnels will make light rail trips to and through DTLA faster with far fewer transfers for most riders. The project is forecast to be completed by Dec. 2021. As we reflect on 2017, here are the top three achievements reached across the project this year. A view from under the intersection of Flower and 4th streets in DTLA of the first completed tunnel. Photograph by Ken Karagozian, 2017. The tunnel boring machine started and nearly completed mining twin tunnels from Little Tokyo to the Financial District. Each tunnel measures approximately 5,700 feet in length and is made of 1,140 pre-cast concrete rings. A view of excavation work below 2nd Street between Broadway and Spring. Photograph by Ken Karagozian, 2017. After several weekends of street closures on 2nd Street, Broadway and Spring in early 2017, all work at the future Historic Broadway Station is now taking place below street level. Similarly, in the Financial District, crews completed the decking of Flower Street from 4th to 5th and excavation of the tunnel box is underway. 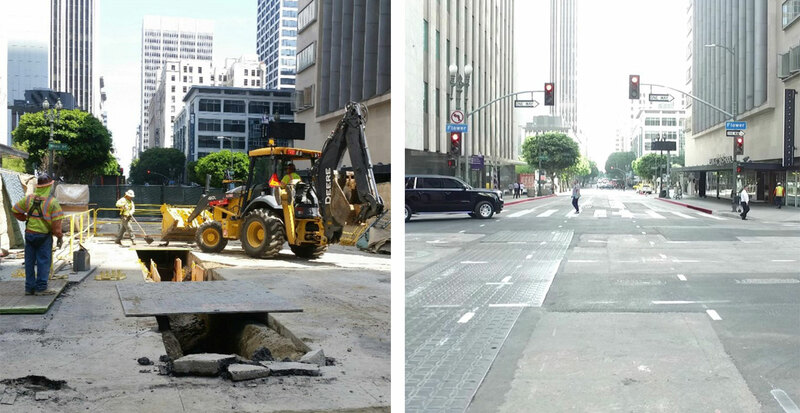 During and after extensive utility relocation at 6th and Flower. 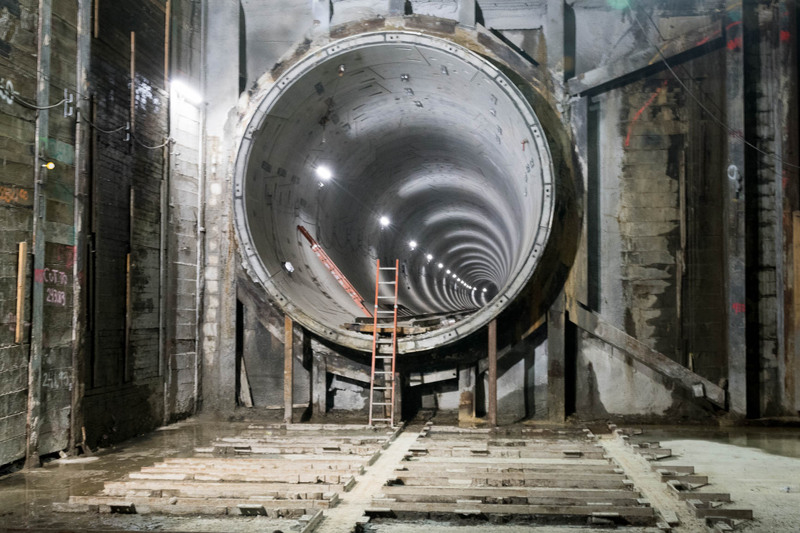 During the five-month closure of the intersection, Metro’s contractor (Regional Connector Constructors) installed more than 11,000 linear feet of five-inch ducts for power cables and two new underground vaults, improving DTLA’s infrastructure for years to come. 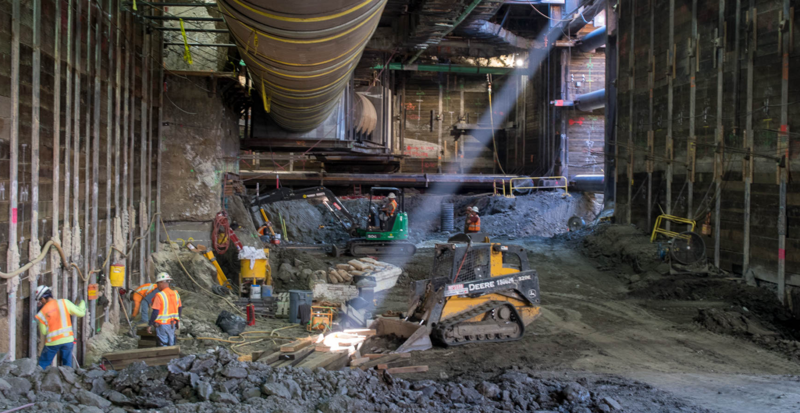 Excavation at the future Historic Broadway Station. Photograph by Ken Karagozian, 2017. Decking work along Flower Street. Photograph by Gary Leonard, 2017. Station construction at the future Grand Av Arts/Bunker Hill Station. Photograph by Gary Leonard, 2017. Work is underway on building the Grand Av Arts/Bunker Hill Station at the intersection of 2nd and Hope. Crews will perform extensive concrete pours to build the floors and walls of the project’s deepest station. Once crews finish excavating the Historic Broadway Station, the same work will take place there. And once tunneling is complete in early 2018, the tunnel boring machine will be demobilized from the Little Tokyo/Arts District Station. The 6th Street intersection will be the final portion of Flower Street to undergo cut-and-cover operations. Once the temporary decking is installed, crews will be able to begin the work of connecting the new train tunnel to the existing light rail tunnel that ends just beyond the 7th/Metro platforms. Crews will be working on station excavation and support of excavation work across the project. Are there plans to encourage a residential tower above the Grand/Bunker Hill Station eventually? Why is it called Historic Broadway station? Metro seems to complicate station names. The station won’t be historic, so the announcement “Historic Broadway Station” won’t make sense. At least the street name is on there. How many Angelenos know where LATC/Ortho Institute or Southwest Museum are? Lots of work in Downtown LA. Reads like DTLA is finally growing up to become a modern city with mass transportation.